Twice a year, in January/February and June/July, there is a unique opportunity to experience some of New York City's finest restaurants for a fraction of the usual price. Throughout the city, restaurants participate in "Restaurant Week" where they offer a three-course lunch for $24.07 (& some even offer dinner for $35). Restaurant Week is a great opportunity to try out a restaurant that may usually be out of your budget, or test some new restaurants with a little less financial risk. You can make reservations for restaurant week (the earlier the better -- many of the Best Choices for Restaurant Week sell out quickly) by calling the restaurants directly or on OpenTable.com. OpenTable has a list of participating restaurants that take reservations through OpenTable, as well as search functions to show you which participating restaurants have availabilities during on your requested date/time. 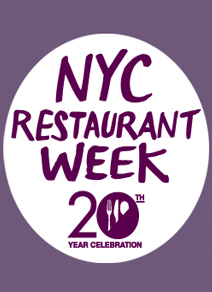 About 1/2 of the restaurants participating in Restaurant Week allow you to make reservations through OpenTable, but if you're making a reservation for dinner, be sure that your restaurant is participating, as their search tools show availabilities for dinner for restaurants that are only offering a Restaurant Week menu at lunch. That said, registration on OpenTable is easy, and you can collect points toward dining gift certificates by booking online.